I wanted to test out the Canon 50mm f/1.8 in my kitchen, which is not very well-lighted, and see how the wider aperture gives me more stable shots. 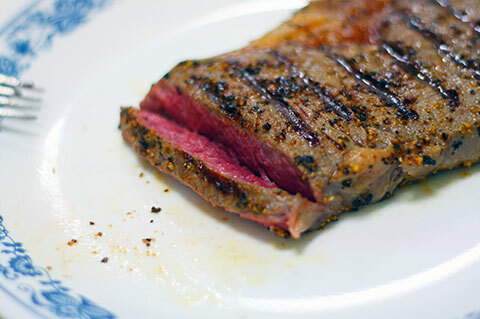 To do this, I cooked up an excuse to test-shoot the lens – grilling a steak! 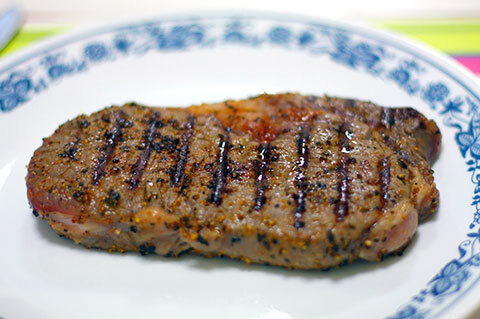 13 Responses to "An excuse for a steak"
congratulations on your new lens. Looks like you managed to capture sharp shots even in the low lightings of your kitchen. The large aperture sure does the trick! just curious, may i know what is the brand for the grill pan that you are using??? hey there! I can’t believe I didn’t discover your place earlier. I’m loving your blog, and I’ve got that same lens too, great shots for a great price 😉 adding you to my blogroll too! Yeah actually most of the shots were taken with a 60mm macro lens, but it doesn’t perform well under low light so I was testing out the 50mm to see how it did. 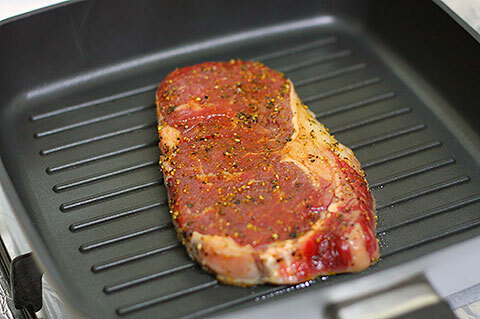 1) what type of spices did u add on top of the steak before cooking? 2) that is all that u added? no need for any other sauce? Hi, I only used freshly ground black pepper and salt. Steaks should be kept simple as possible. However you can consider adding a clove of garlic while you cook it. You can also baste it with butter near the very end to get a richer taste. They commonly do that in restaurants. oh sorry another question. 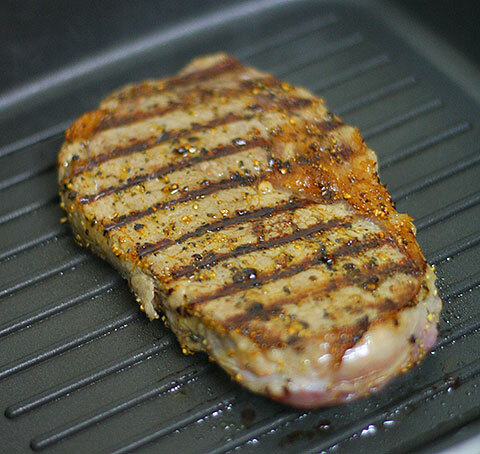 u are using a non-stick pan right, so no oil is needed, the steak wun stick to the pan right. btw what heat lv to use and roughly how long is needed to cook it? Yeah I’m using a nonstick pan but it might be best to brush a very thin coating of oil so that more flavour is released when grilling. Alternatively you can rub the steak with some oil after you season it. For the heat I normally turn up a medium flame and sprinkle drops of water on the pan. Once the water droplets sizzle straightaway, that’s hot enough. The timing is tricky because it depends on the thickness of your steak and the heat. You probably won’t get it right on the first try but what you can do is to try 2-3 mins on each side for a piece about 1 finger thick. Then you cut and see if it is the doneness you want. If not just continue to cook. This one needs a bit of trial and error one.